When the first jet aircraft engines are developed, engine life was about 100o hours, give or take. so you could run an engine life test in a fairly short time. Which means that test failures aren’t going to slow things up very much. On the other hand, the PW1000g probably has an expected life of 50,000 hours or more. So a life test is going to take a very long time . Which means that your development time is also going to be a very long time. This is especially true of a gearbox. And once the ground based testing is complete, you have to fly it. For thousands of flight hours. With changes as necessary, meaning you have to start all over. The advantage is that, in the end you have engines that are good for very long times between overhauls and large part savings. Then you have to make the engines, which may mean as it did in this case a rethink as to how you make engines and a new plant. To people outside the aircraft business, what may be most remarkable about the engines is that they took almost 30 years to develop. That’s about 15 times as long as the gestation period of an elephant and unimaginably longer than it takes to pop out a smartphone app. Could Pratt have gotten the hardware out faster? Probably. But industrial innovation on the scale of a commercial jet engine is inevitably and invariably a slog—one part inspiration to 99 parts perspiration. The problem was that the fan was attached to the same shaft as two other parts of the jet engine, the low-pressure turbine and low-pressure compressor. Those parts would be more efficient if they ran faster, not slower. Sharing a shaft was a compromise that hurt each part’s performance and left nobody happy. The solution McCune and his co-workers pursued was one that had already been used successfully on turboprop planes: a gearbox between the shaft and the fan that lets the fan run slower while the compressor and turbine run faster. The gearing approach hadn’t been tried at the scale of a commercial jetliner because the conventional wisdom was that it would be too heavy and wear out too quickly. “We started studying all gearboxes in service” to determine what the obstacles really were, says McCune. The biggest challenge in scaling up was how to keep the gearbox, which is about 20 inches in diameter and weighs about 250 pounds, from being torn apart if there was a shock that wrenched the fan in one direction and the shaft in another. Adding steel for stiffness would make the engine too heavy. To put some give into the system, McCune’s team attached the gearbox rigidly to the fan but somewhat loosely, with bendable metal baffles, to the compressor/turbine shaft and the engine case. Of course once you’ve built the thing you need to get customers in line. This can be hard, because at this level, it’s purely a numbers game and the number that people care about is fuel savings. Pratt seems to have met the numbers. CT public TV has a very good series on Pratt and what they have done. The competition for engine superiority goes on with the risk and rewards being huge. Pratt and Whitney and CFM International are making new more efficient airplane engines. Pratt and Whitney says its new engines—which use an internal gearbox to slow down the speed of the fan—could save 20 percent on fuel consumption compared to an airliner with a conventional engine. Competitor CFM International, meanwhile, has introduced its own advanced engine, called the Leap, which could achieve similar improvements without such a radical break from existing technology. Both new engines have been deployed on different versions of Airbus’s new jet, the A320neo. Pratt and Whitney spent more than 20 years and $1 billion developing its new geared turbofan engines, which use larger fans (up to 81 inches in diameter on the A320neo) and a gearbox to make the fans rotate more slowly than the internal turbine that drives them, making them more efficient than traditional engines. Adding the gearbox, however, makes the engines heavier and increases aerodynamic drag. The PurePower PW1000G engine’s fan-drive gear system is just one component of this next-generation engine. 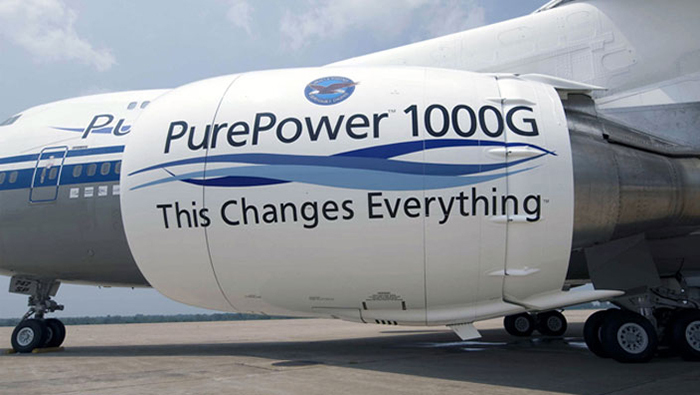 The PurePower PW1000G engine also incorporates advances in aerodynamics, lightweight materials and other major technology improvements in the high-pressure spool, low-pressure turbine, combustor, controls, engine health monitoring and more. The CFM International Leap engine uses lightweight composite materials, such as carbon fiber fan blades, to achieve energy efficiency gains that the company says are comparable to those of the Pratt and Whitney engine. The Leap represents “the ultimate refinement of the traditional turbofan engine,” says aviation analyst Richard Aboulafia, vice president for analysis at the Teal Group. To the victor goes thousands of engines sold and all the parts that go with that for decades. The loser has to risk again and survive on parts for an ever declining population of engines from aircraft flying ever closer to the boneyards. That’s why in the aircraft engine business you pursue the exotic technologies and technical risks. because all too often there is no second place. Exotic materials, ne manufacturing techniques. If you can make those work, then can get you ahead. The business never ends and being on your toes is part of the game. Linked back from my place (where you’re a recent addition to my blogroll).